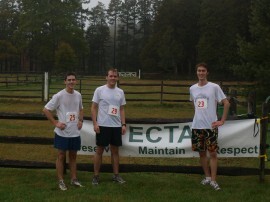 Once again, ECTA’s 5th Annual Run for the Trails was a great success for all involved. The runners raved about the course and our thanks go esepcially to Linda and Professor John Donovan for hosting the event on their beautiful farm. The course wound for 5 miles through the countryside, woods and fields. Carol Lloyd once again did a fantastic job laying it out. We had runners from as far away as Maine and several, including the men’s winner, Andy Whittaker, who came up from Boston/Cambridge. And congratulations to Kristen Cappello for inching out Alison Fisher to be the winner of the Womens Division. 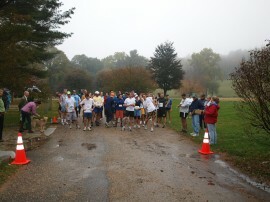 Thanks to all who came out to volunteer and run and we look forward to seeing you all again next year. Silver: EBSCO, Brinck Lowery, New England Running Company/Salomon Sports, First National Bank of Ipswich and Manchester Athletic Club.